Nurse, 3rd VT INF, from initial organization, and "nursed many a sick soldier back to life and health in Camp Lyons, Camp Advance and Griffin, near Washington, D.C." (St. Albans Messenger, 30 April 1914). 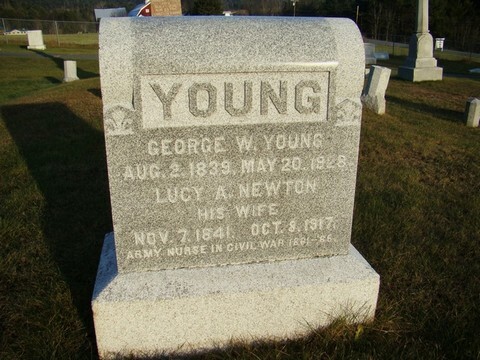 She married George W. Young in St. Johnsbury in 1864. In another article in 1914 detailing their 50th wedding anniversary, she is erroneously listed as the "only surviving Civil War army nurse in Vermont," (Caledonian, 28 April 1914), which distinction we now know belongs to Harriet Hinkson Holmes of Worcester. 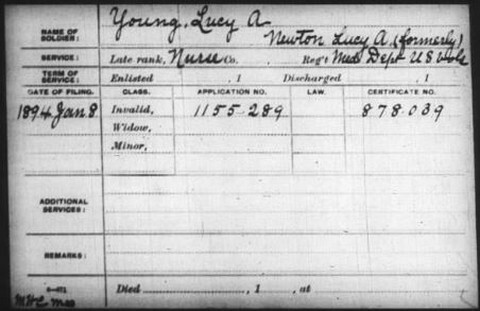 Lucy died in October 1917, and is buried in Grove Cemetery, St. Johnsbury. Her headstone is inscribed "Army Nurse in Civil War 1861-65." The funeral for Mrs. Lucy A. Young, for many years a resident of St. Johnsbury, and who passed away in South Sudbury, Mass. Monday, was held here in the Universalist Church yesterday, the Rev. Clarence L. Eaton officiated at the service, and interment was in the family lot at East St, Johnsbury. The deceased was a resident here the greater part of her 76 years of life, and was a member and faithful worker in the Church of Messiah. Mrs. Young was thought to be the last nurse in the Civil War was living in Vermont, and for many years was one of the foremost members of The Woman's Relief Corps. Many beautiful floral tributes were received from her many friends made during a lifetime of Service. Mrs. Collins Brodein sang "Lead Kindly Light". The Woman's Relief Corps attended the service in a body, and performed their ritualistic ceremony. The bearers were her four sons of the receaser, Arthur of St. Johnsbury, Edward of Lyndon, and Allie and Bert of South Sudbury. Two daughters also survive. Mrs. Frank Olcott of this place, and Florence Young of Colorado. The latter was unable to reach here in time for the service.